Having spent our last night at Bayeux, we decamped from the hotel and headed out of town, stopping briefly at the Musée Memorial de la Bataille de Normandie ("Memorial Museum of the Battle of Normandy"), although we didn't have time to go inside, and we were suffering a little from "museum fatigue," anyway. Outside the museum are a number of armoured vehicles, including another of "Hobart's Funnies," the Churchill "Crocodile" Flamethrower Tank. The Crocodile was such a fearsome weapon that there were cases after D-Day of captured crews being murdered by the German troops they surrendered to - ironic given how extensively the Germans themselves used flamethrowers on the Eastern Front. 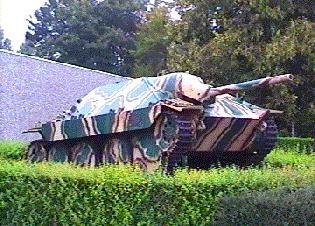 Rare German Panzerjager 38 ("Tank Destroyer") "Hetzer" with Pak 75mm gun outside the museum. The back of the Hetzer, showing the rear access hatch. 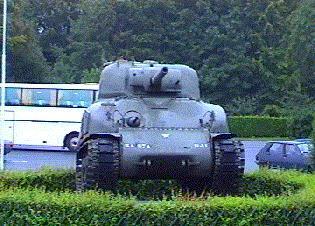 American M4A1 Sherman medium tank. The single-cast curved body was superseded by the more angular welded version, such as the one seen at the Musée Vierville on Day 6. 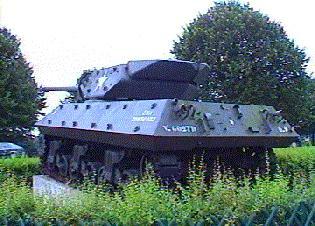 The rectangular feature near the front-left side of the tank is additional armour plating, which not all Shermans had. Tank crews often improvised extra protection in the field, such as welding track links to the sides of the turret, or strapping sandbags on the body. 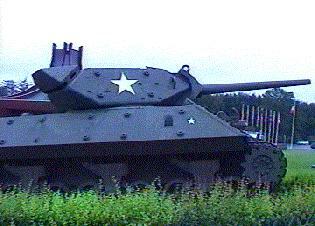 The American M10 Tank destroyer, a 76.2mm gun on a Sherman chassis. 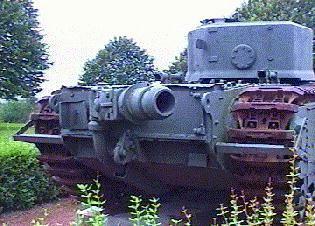 It was also used by the other Allied nations, for example with a 17-pounder gun as the "Achilles" by the British. The large block at the back of the turret is a solid counterweight. 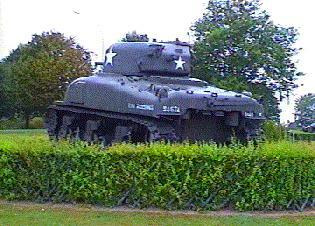 The body armour, although thinner than the Sherman, was more effective because of its sloped construction, as contemporary anti-tank guns relied on hitting at right-angles to achieve penetration. 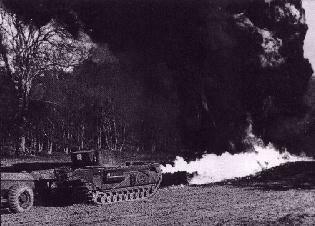 Churchill "Crocodile" Flamethrower Tank. The flame-projector on the right of the glacis replaced the usual hull-mounted 7.92 Besa machine gun. 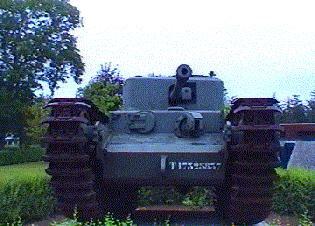 The tank retained its main gun and the second coaxial machine-gun in the turret. The pipe at the rear of the tank is the articulated coupling for the armoured flame fuel trailer, which is unfortunately missing from this example. 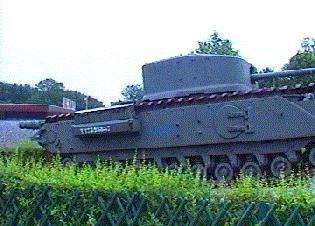 Note the circular side-access hatches, compared to the square ones on the AVRE at Graye-sur-Mer (Day 7). The fuel trailer coupling. The trailer contained 400 gallons of flame-fuel, and cylinders of nitrogen as a propellant. 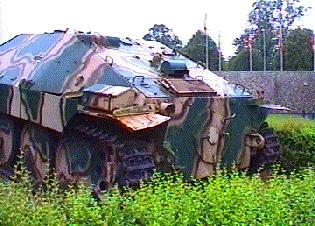 Once this was exhausted, the trailer could then be jettisoned, and the "crocodile" free to operate as a conventional gun tank. Crocodile in action. The flame range was about 90-120 yards, and a full trailer was good for 100 one-second bursts. 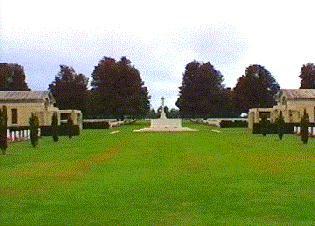 Within sight of the Museum is the main Commonwealth War Cemetery for the D-Day landings, along with the Memorial to the Missing of Normandy. The Memorial commemorates those who fell in the Battle of Normandy and the advance on the Seine: UK - 1807; Canada - 270; South Africa - 1. 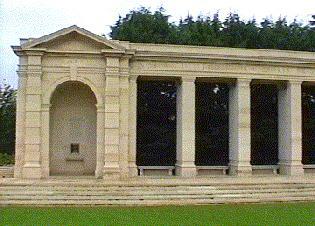 The names are engraved on the sides of the pillars. The Bayeux Commonwealth War Cemetery contains the following casualties: UK - 3,935; Canada - 181; Australia - 17; New Zealand - 8; South Africa - 1; Poland - 25; France - 3; Czechosovakia - 2; Italy - 2; Soviet Union - 7; Germany - 466; Unidentified - 1. 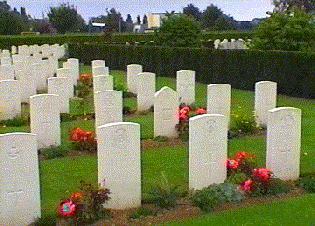 The pointed headstone in the second row is one of the 25 Poles buried in the Cemetery. Soviet and and Czech graves. 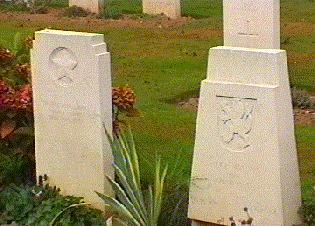 The utilitarian cast-concrete French cross contrasts with the headstone of an Allied Merchant Seaman of Arabic origin. The curve-based "notches" at the top of the latter denote a death from non-War causes. 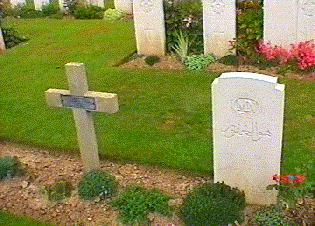 One of two Italian casualties at Bayeux. 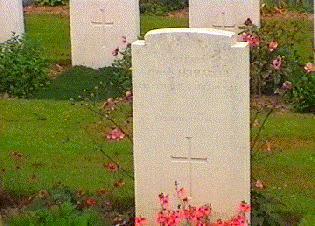 The CWGC national design is similar to the Merchant Navy one in the previous picture, except that the bases of the "notches" and flat and not curved. By the early afternoon we stopped at Les Andelys and found accommodation at the plush but expensive Hotel de Normandie (1, Rue Grande). As we were only staying for one night, they insisted that we had dinner in the hotel restaurant, although this wasn't such as restriction as the food was very good, while a wander round the town demonstrated that there weren't many other alternatives available, anyway.